Mr. Glenn Perry was introduced to martial arts by his father in the late 1960s at a young age. His father, Clement "Slim" Perry, is a retired U.S. Army Veteran who served several tours in Germany, France and Korea as an MP (Military Police). Perry was encouraged by his father, who at the time, was studying Jujutsu at a well known Sports Center in Brooklyn, New York called "St. John's Community Center" . After a short stint in Boxing, which he didn't like, his dad enrolled him in Jiu-Jutsu at the "Diamond Mine Dojo" under Sensei Al Govine. Years later another Jiu-Jutsu Sensei, Master Robert Crosson, also a friend of his dad's, took a young Perry to the Ju-Jutsu mat. Sensei Crosson taught many youngsters at a local Youth Center also in Brooklyn, New York. His first experience with Karate was with another old friend of the family, Sensei George Cofield, Head of Tong Dojo in Brooklyn, NY. He soon found his calling pounding the "makawari" in the Shotokan style with Sensei Toyotaro Miyazaki and Sensei Masakazu Takahashi at Jerome Mackey's Karate Studios on Flatbush Ave. *It was during this time that he met Sensei Ron Van Clief and Sensei Owen Watson of Nisei Goju Ryu. Perry studied, for a short time, the art of Kyokushin Kai Karate at the BAM Center in New York City under Chief Instructors Tadashi Nakamura and Shigeru Oyama. Mr. Perry also spent over 15 years with Master Pierre Rene, the founder of the American Shotokan Association. Sifu Moy Yat mentored Perry and introduced him to the Chinese arts of the Iron Palm and Chi-Gung in New York's Chinatown. In the mid 1970s Kyoshi Ron Van Clief invited Perry to meet his Teacher and see how he trained! Perry gives credit Sensei Peter Urban for having a major impact on his martial arts training and also responsible for helping him reach advanced levels of martial arts understanding. Mr. Perry is an "honorary" member of U.S.A.G.A (United States of American Goju Association) founded by Sensei Peter G. Urban. Glenn Perry is a first generation, closed-door disciple of Grandmaster "Shidoshi" Ron Van Clief, founder of the CHINESE GOJU SYSTEM & BLACK DRAGON AIKIJITSU and has been training exclusively in both styles for over 40 years. 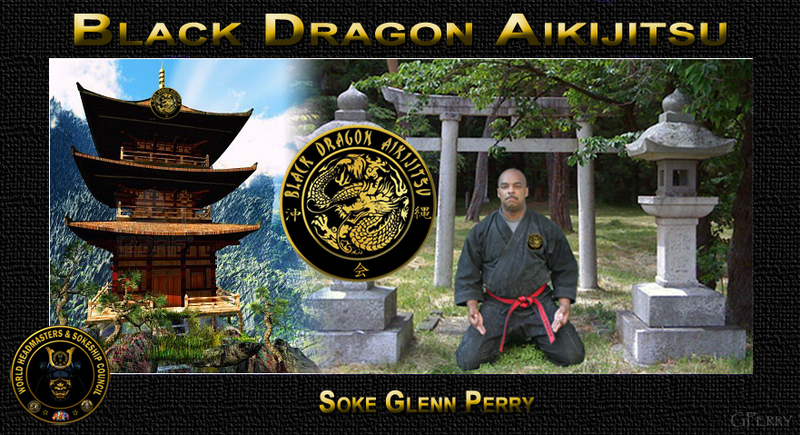 Glenn Perry is a life long student of the ARTS of BUJUTSU and committed to the growth and development of BLACK DRAGON AIKIJITSU and all martial arts systems in general! In the mid 1970s, Perry began studying under Grandmaster Ron Van Clief, founder of both the Chinese Goju System and Black Dragon Aikijitsu. Glenn Perry began teaching Karate as Chief Instructor of the Black Dragon Temple in Brooklyn, New York, from 1978 to 1986. He also coached the Long Island University karate team for 2 years. A devoted martial arts historian and career sensei, Mr. Perry was inducted into the "Masters in Action Hall of Fame" in 1983. In 1985 he was awarded the level of "Rokudan", 6th Degree Black Belt. At the time he had become the youngest practitioner in the Chinese Goju System and BLACK DRAGON AIKIJITSU to receive the level of 6th dan. In 1986 Mr. Perry was given permission to introduce Chinese Goju to Mexico and South America. That year, Perry moved to Mexico and began teaching Chinese Goju at a small dojo in the state of Morelos, Mexico. While earning his seventh and eighth degrees in Chinese Goju and Black Dragon Aikijitsu, Perry later served as Head Instructor at the Chinese Goju System Headquarters. Mr. Perry has appeared in several martial arts books, magazines, training videos as well as television including "The Oriental World of Self-Defense". He has given numerous martial arts lectures and demonstrations around the world. In 2000 Perry also established Goshin Ryu Aiki Jujutsu, which is an extension of his training and reflect his interpretation of martial arts in a "civilized" society. Perry created Goshin Ryu Aiki-Jujutsu which means "Way of Self-Defense or Art of Self Protection". The aim is to develop competent black belt instructors committed to martial arts and involving themselves in their communities. Guided by passion, the principles understanding and mutual respect, as the core foundation, Perry develops students into competent modern warriors. In 2001 Glenn Perry became the first "Soke" of the system, a title given him by his teacher, Shidoshi Ron Van Clief, Grandmaster. That same year he was inducted into the "World Head of Family Sokeship Council". In 2012 Grandmaster Ron Van Clief, founder of BLACK DRAGON AIKIJITSU ceremoniously bestowed Mr. Perry with the title and position of "Shidoshi", "inheritor of the Arts" and the recognized Headmaster of the BLACK DRAGON AIKI-JITSU SYSTEM. There is great value to be found by combining concepts from several different martial arts disciplines. This is the mindset that is incorporated into this system of self-defense and self-improvement. BLACK DRAGON AIKI-JITSU is our WAY OF LIFE and based on essential elements based around the soft and hard Arts of Karate, Jujutsu, Aiki-Jujutsu and the philosophies of Zen-Do. Mr. Perry is a passionate student of martial arts and recognizes the monumental efforts of the Sensei before him. In no way does he wish to modify the classical ways. Perry has spent many years training in arts of Karate, Ju Jutsu and Aiki Jujutsu. He believes that the direction for BLACK DRAGON AIKIJITSU is grounded within the precepts as originally intended by the founder Ron Van Clief, Shidoshi. Mr. Perry believes that no martial art should be stagnant and teaches that "Change is Constant. Glenn Perry spends a considerable amount of time on historical research of Martial Arts from 1868 to the present. His primary focus is on the post WWII development and growth of martial arts in the United States of America. He remains committed to assisting others as both martial artist and individuals. His own experience with self-defense and martial arts training has made him genuinely interested in expanding his knowledge of martial arts around the world. Shidoshi Glenn Perry, 10th Degree Red Belt, a life-long student with almost fifty years experience in martial arts. Headmaster of "The Black Dragon Aiki Jitsu Systems" and President of "The World Headmasters Sokeship Council".